The story of the Coast watchers is one of extreme courage and personal sacrifice. It is about the events that contributed so much to the ultimate Allied success in the Pacific Campaign. 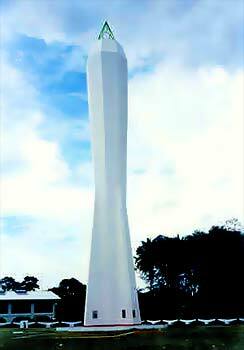 Australia's "Cloak and Dagger" men, who operated behind the Japanese lines during the war, were honoured on 15th August 1959 - the 14th Anniversary of the end of the war in the Pacific - when Senator Gorton, then Minister for the Royal Australian Navy, officially dedicated and lit the COASTWATCHERS MEMORIAL LIGHT at Madang, New Guinea. At sunset, the beacon sent its one million candle-power beam into the Bismark Sea for the first time, honouring the Coast Watchers, living and dead, European and native, who took part in the war's most hazardous and secret spy operation. The dark clouds of war loomed in the Pacific early in the1940s and the warning signs did not to go unnoticed by Australian Naval Intelligence who correctly assumed that it may be useful to post observers on the key strategic islands around the North of Australia including New Guinea, and who could report movements of 'enemy' shipping and any other military activities. It was a concept that had been looked at by the Australian Military and had its rudimentary plans drawn up as far back as WW1, when German influence was strong in the South Pacific. Special Operations Australia (SOA), was a Military Intelligence unit and was established in March 1942, at the direction of General Thomas Blamey, and was modeled on the British 'Special Operations Executive' or SOE. SOA operated under the umbrella of the Inter Allied Services Department (IASD). This organisation was Most Top Secret and to this day there is still much unknown about their WW2 exploits which consisted of 182 (at least) Separate Missions. The Coast Watchers, as they were to become known, were commanded by Commander Eric Feldt, R.A.N., O.B.E. (Pictured Left). Initially it contained a number of British SOE officers who had escaped from Singapore before its surrender, these officers along with their Australian counterparts formed the nucleus of the IASD, which was based in Melbourne. In June 1942 the unit was organised in other subordinate units such as 'Z Special Unit' and also 'M Special Unit' which concerned itself with Internal Security Issues within Australia. the forerunners of Australia's Security and Intelligence Organisations today. Specialist Training Schools were built all around Australia, the most well known being 'Camp Z' in Refuge Bay, a part of Broken Bay, about 40 Kilometers North of Sydney, Z Experimental Station (aka "The House on the Hill") located near Cairns in Far North Queensland. Fraser Commando School (FCS) situated on Fraser Island, Queensland and Careening Bay, on Garden Island, Western Australia (where the R.A.N's Fleet Base West is now located) and also the highly secretive 'Services Reconnaissance Department'. The men who became Coast Watchers were attached to the very multicultural 'Z Special Unit' and came from many different backgrounds and occupations. Military Officers, Missionaries, Australian Colonial Officials, plantation owners and even an American who managed to get transferred from his regular unit to this most unusual group. On each of the key islands, the Coast Watchers established lookout points high up in the mountain jungles and from their lofty and lonely vantage points they could observe and report via radio to Allied HQ the details of enemy shipping and aircraft movements. These reports were absolutely vital to the outcomes of the battles in the Pacific, since they gave early warnings to the Allies of attacks by Sea and Air and enemy movements, enabling the allies time to prepare and deploy Defences or Interception forces. They gave invaluable assistance to US Forces during the Battle of Guadalcanal. 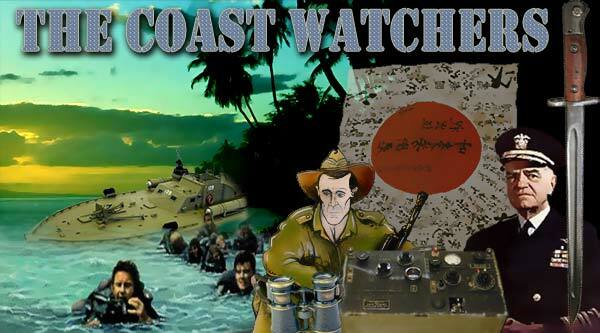 The Coast Watchers were a vital link in Australia's defensive chain. They even aided VMF-214, the legendary Black Sheep Squadron, commanded by the late Major Gregory R. ("Pappy") Boyington who was noted to say, "If it weren't for the Coast Watchers, then we probably would have lost World War II". Henderson Field and the air power of the Cactus Air Force provided significant tactical advantages for the US forces fighting to maintain a foothold on Guadalcanal. During most of the campaign, the primary mission of the Cactus Air Force was to intercept Japanese bombers and fighters. The men of the Cactus force were fighting a defensive battle to protect their turf. They knew Henderson Field was a primary target for almost every Japanese bombing mission. The fighters would receive word of inbound enemy aircraft from their early warning radar or from forward observers called coast watchers. The Royal Australian Navy trained the coast watchers prior to World War II, and they were located throughout the Solomon Islands. Several of these observers were ideally situated along the flight route between Rabaul and Guadalcanal. With word from the coast watchers of “planes inbound your location,” the F4Fs had just enough time to scramble and climb to an advantageous altitude above the enemy formations.The F4Fs had poor climb characteristics at high altitude, and the Cactus pilots needed all 30–40 minutes of warning to reach 28,000 feet. Without advanced warnings from radar and the coast watchers, the Cactus Air Force could have been easily destroyed on the ground like the ill-fated air forces in the Philippines. The next day, the Japanese mounted their first raid in nearly two weeks. Warned by the Coast Watchers, Navy and Marine fighters rose to intercept the 70-plane force. Now a lieutenant colonel, Harold "Indian Joe" Bauer was making one of his periodic visits from Efate, and scored a kill, a Zero, before landing. A native of North Platte, Nebraska, Bauer was part-Indian (as was Major Gregory "Pappy" Boyington). A veteran of 10 years as a Marine aviator, he watched the progress of the campaign at Guadalcanal from his rear-area base on Efate. He would come north, using as an excuse the need to check on those members of his squadron who had been sent to Henderson and would occasionally fly with the Cactus fighters. His victory on the 28th was his first, and soon, Bauer was a familiar face to the Henderson crews. Bauer was visiting VMF-224 on 3 October when a Coast Watcher reported a large group of Japanese bombers in bound for Henderson. VMF-223 and -224 took off to intercept the raiders. 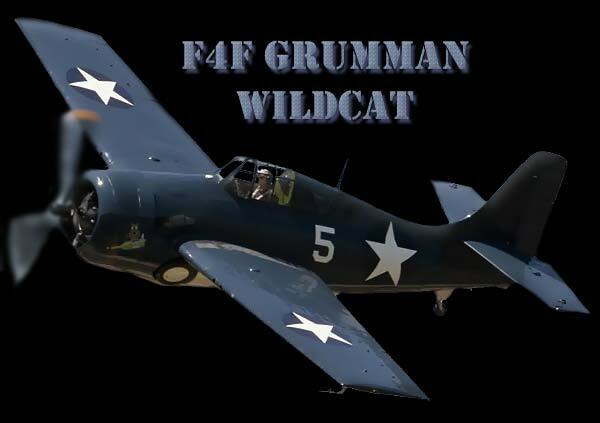 The Marine Wildcats accounted for 11 enemy aircraft; Lieutenant Colonel Bauer claimed four, making him an ace. On 30 September, Admiral Chester Nimitz, Commander-in-Chief, Pacific, braved a heavy rain storm to fly in to Henderson for an awards ceremony. John Smith, Marion Carl, and Bob Galer, as well as some 1st Marine Division personnel, received the Navy Cross. Other members of the Cactus Air Force, Navy and Marine, were decorated with Distinguished Flying Crosses. Nimitz departed in a blinding rain after presenting a total of 27 medals to the men of the Cactus Air Force. After a surface action, several hundred men are in the water. Our survivors may float among the enemy survivors or the reverse. Calling out to a life-jacketed survivor in the dark can be hazardous. The morning of the 13th of October, I noted the phenomenon of how long a Japanese flat hat floats. They were visible for days after a surface action. Our white hats soak up water, then are gone. At 1140 got advance warning of impending air raid, and went to general quarters. We hear a lot about the Aussie Coast Watchers who give us these early warnings. They are hidden in the jungles of the island chain all the way up to Rabaul with good radio equipment and lots of guts. Jap bases are so situated that surface or air forces pass one or more of those islands when they raid southward. I often wondered, when advance warnings were received, why the enemy did not make a hull-down seaward detour on a raiding foray. The Coast Watcher warnings gave us time, and considering our weaknesses, indispensable time. The Coast Watchers also assisted in the evacuation of Western refugees, both colonists and missionaries. One of their other important tasks was to locate Allied personnel whose planes or ships had been downed or sunk and to help them make their way back to their own lines. 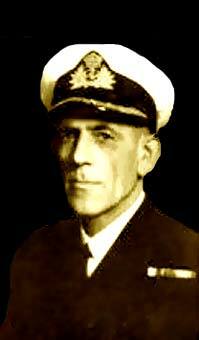 Indeed, it was an Australian Coast Watcher, Arthur Reginald Evans, (Pictured Above) who found the survivors of the rammed and sunk US Navy Torpedo Boat, PT 109. 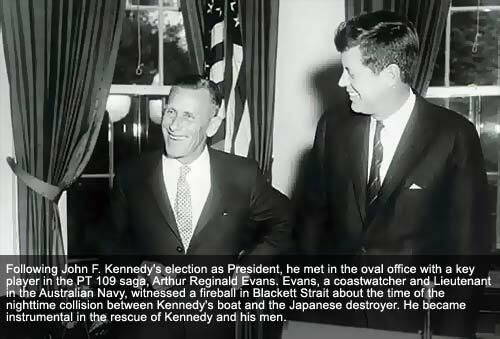 Then he assisted her Skipper, former US President John F. Kennedy and his men to escape and to ultimately reach the safety of their own lines. The Coast Watchers themselves were all given commissioned rank in the Royal Australian Navy in the hope that this would preserve their lives if captured by the Japanese, whereby under the rules of warfare, they could not be executed as spies, although no one knew at the outset that it would make very little difference to the fate of many of these brave men at the hands of the brutally unforgiving Japanese. They we hunted, chased and harassed mercilessly by the Japanese and beheading was common punishment. The amazing story of the Coast Watchers is still all but unknown in the U.S.A. but as the famous US Admiral 'Bull' Halsey said "the Coast Watchers saved Guadalcanal, and Guadalcanal saved the Pacific,"
On 21 January 1942 four IJN carriers were close enough to New Ireland that in the early morning about 60 bombers and fighter planes from the Kagi and Akagi attacked Kavieng, concentrating on the wharf area, Chinatown, the recently built Kavieng airstrip and strafing everything else. On the 23rd of January 1942, Japanese forces captured Rabaul and established a major strategic base there, but another place that suffered quite badly at the hands of the brutal Japanese, that is little known about, is Kavieng. Kavieng is the main port and commercial centre of New Ireland, it was invaded and captured on the same day. The Japs had already conducted a 'study tour' of the Island well before the outbreak of war - Harry Murray, a decorated Australian War War One Veteran, Local RSL President and Community Leader had a fall out with them at the time, Harry, having a premonition of impending war refused to give them any cooperation or the 'cooks tour' of the Island and its airstrip, incurring the wrath of the Japanese Officer in charge. Harry knew what was coming. When the Japs landed in January '42 they went hunting - on their list was Harry Murray. When it became obvious to everyone that Japanese ships were nearby and invasion was imminent. The decision was made by District Officer MacDonald to evacuate all civilians from Kavieng, and Major Wilson withdrew most of his small force to nearby Kaut, located on the West Coast, where separate camps for civilians and military had been prepared. The small Australian commando force, the 1st Independent Company, had arrived in Kavieng in July 1941. Comprising only about 250 men it had its HQ in Kavieng but was required to have small units also stationed at Manus, Namatanai, Buka, Tulagi, an island near Honiara in the Solomon Islands, and Vila in the New Hebrides. Its effectiveness was minimal, spread as it was over thousands of kilometres, and it was in effect sacrificed, being unable to resist any determined Japanese force of any size, and in fact not one of the men stationed in Kavieng survived the war, only the officers, who by good fortune, had been sent to Japan on a different vessel to which the 'Other Ranks' had been loaded on to, survived. 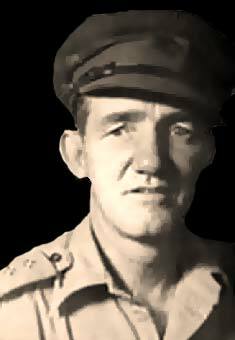 Murray awoke surprised by the landing of the R Invasion Detachment at about midnight on the Kavieng waterfront and ran for his life towards the airstrip and the few Australian commandos there. The Japanese War History says the invading forces, arriving from the Japanese administered island of Truk, north of Kavieng, had captured the airfield by 3.35am on 23 January 1942 encountering no hostile infantry or inhabitants and that the 13 holes blasted in the airstrip were filled in five days allowing fighter planes to operate from it. This conflicts with markedly from Australian reports that there was a fierce firefight as the commandos retired from the airstrip leaving an estimated 300 Japanese dead. Harry Murray and the commando unit blowing holes in the Kavieng airstrip retreated through the mangrove swamps at the back of the airstrip towards the camps near Kaut. A track through the swamps, which was purposely cut for this specific reason, could not be found in the darkness and confusion and it took two days to wade through the crocodile infested mangroves. Harry Murray so narrowly escaped the advancing Japanese at Kavieng that he had to cross the swamps in his pyjamas, barefoot and without his false teeth. They would not use the East Coast highway, assuming correctly that the Japanese would also land in the Maiom (now Utu) school and Panapei plantation area, cutting the road and isolating Kavieng. The civilians near Kaut, now led by Harry Murray and Jerry MacDonald, decided to attempt to escape on foot down the West Coast. At that time the road only went as far as Lamernewai plantation and one, Caulfield Kelly, decided not to go. Others dropped off at plantations on their route when they met managers still working undisturbed on their plantations, while others joined the escaping party which was desperately looking for some kind of boat to allow them to leave New Ireland. Among many of the Plantation owners there was an air of complacency, believing they were of more use to the Japs by staying on continuing to manage their plantations. This assumption proved lethal for they were all to die. After long delays the group crossed from Ulaputur to the East Coast with the help of Father Neuhaus, the Namatanai parish priest, and stayed for a while at Muliama where they met nine Australians escaping from Rabaul. Eventually an escape was made possible by going to Tanga Island and forcefully requisitioning a small boat the Quang Wha belonging to Chin Pak, and returning to Muliama. On 30 April, over three months after the Japanese invasion, and overcoming many difficulties, they left New Ireland and on the afternoon of the 5th of May made a landfall at Mi-Mi on the North coast of Papua and on the 6th were at Buna. One very small step ahead of the Jap invasion of New Guineau. The saga of the escape from New Ireland is the stuff of legends. Harry Murray's inspirational leadership and unwllingness to give in to adversity not only, inevitably, saved his life, but set him up for for even bigger and better feats of courage and endurance later on. Nearly all the civilians who complacently or otherwise remained on New Ireland and became prisoners of the Japanese, died. Early in July 1942, Sydney, Australia was bulging at the seam with Allied Servicemen of all branches of the armed forces and from many different nationalities - Americans, Dutch, Filipino, Free French from New Caledonia, as well as Englishmen, New Zealanders and of course, the locals, Australians. The war with Nippon was now a mere seven months old but in that short seven months, Sydney had undergone a major transformation, from virtual indifference to a far off war in Europe and North Africa, to a startling awareness of a major war right on its door step! Indeed, this awareness had been heightened by the bombing of Darwin by the Japanese on 19th February 1942 and the subsequent attacks on Sydney Harbour itself by Japanese midget submarines on the night of the 31st May 1942. In fact, with her best fighting troops serving overseas Australia was very vulnerable and almost in a state of panic. After his escape from the Japanese in New Ireland Harry eventually arrived in Sydney only to see many of his old mates already in uniform. Harry Murray re-enlisted as soon as he could. Wondering what he had to offer the Australian Military, if anything. Harry waited. Harry Murray had spent many years of his life on his plantation at Kavieng, New Ireland he knew the area as he knew the back of his hand - He was soon to find out just how useful he was to become. The wait was over. Harry Murray now found himself attached to the highly secret organisation known as "Z" Special Unit. One of a number of units under the control of Colonel Mott. The men recruited for this unit were men who had a special knowledge of all areas now occupied by the Japanese. The unit comprised men who were willing to return to these areas and work behind the enemy lines, obtaining information on enemy strength and disposition of forces, coastwatching, carrying out sabotage by disrupting communications, mining ships, destroying arsenals and generally harassing the enemy. The 'New Guinea team' of Z Special were relocated to Cairns and immediately began training. Parties were formed consisting in most cases of four members: one leader, two utility men and one wireless operator. All members, however, were given instructions in wireless operations, which would be their life line. Al men were skilled in clandestine operations, weapons and explosives. Left: Six New Guinea men of the original "Z" Special Unit, Cairns, Queensland, in 1942. 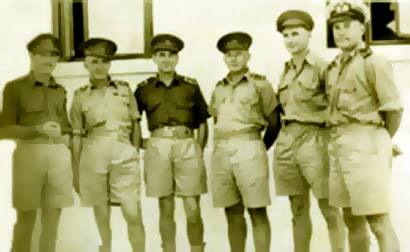 Left to right: Lieutenants D. Chambers, H. Murray, R. Cambridge, G. Greathead, G. Stevenson, and P. Mollison. After completing the course at Cairns on the use of limpet mines the unit received orders to return to Melbourne where accommodation was provided for them at various hotels. When all was ready for departure, Murray was called to Colonel Mott's office to receive last minute instructions and the necessary movement papers. It was then that he learnt that the contents of the containers labeled "valuable supplies" would be under his charge for the journey and that they contained the new highly powerful plastic explosive C4 which was still on the secret list. The party moved from Melbourne to Adelaide then north to Alice Springs. They then travelled by train from Alice Springs to Darwin where they were conveyed five miles out of the township to the Quarantine Station which had been taken over for the use of "Z" Special Unit. To hide their true identity, they were referred to as the "Lugger Maintenance Section". 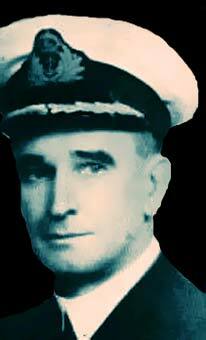 Murray then received orders to proceed to Townsville in North Queensland where he was to report to Commander Feldt at the Naval Staff Office. Commander Feldt succumbed to illness in March 1943 and his job was taken over by Lieutenant-Commander J. C. McManus, R. A. N., who was assistant to the Director of Naval Intelligence. Murray received orders to return to Brisbane and report to Commander McManus at an address in Queen Street. Commander McManus explained that Major Keith McCarthy had been instructed to return to Port Moresby to select natives to be trained in Australia to assist in operations in New Guineau. McCarthy had reported that natives from almost every island and township throughout the territory had been found and that arrangements were under way to transport them to Brisbane. Murray's job was to establish the training camp as a centre to accommodate and train outgoing parties, and act as a rest centre for incoming parties. Murray established the camp a few miles south of the Beaudesert township. Within a few days, the camp was a hive of activity with stores and equipment arriving daily. Towards the end of the first week, the first members began to trickle in. Among these were Sergeant R. W. (Bill) Dolby, Corporal R. J. 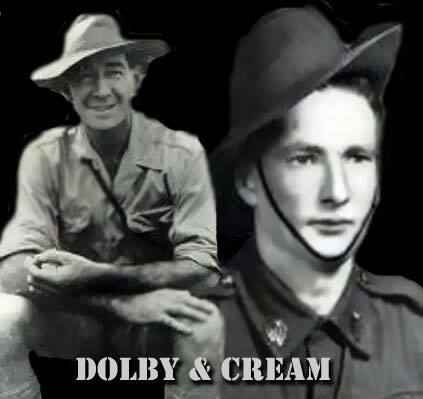 (Percy) Cream, and Corporal C. F. (Snow) Evans. Ten days later 360 natives arrived by army trucks and commenced special training. The Scamp arrived at her destination off the east coast of New Ireland at 04.30 hours on 3rd October and lay quietly under the sea to await daybreak. At first light the periscope was raised and the shoreline closely inspected. During the day, bearings were taken, and they moved slowly along inspecting the coast in order to select the correct landing spot. Carefully, they scanned the shore for signs of Japanese activities looking for new buildings and installations that would indicate a Japanese presence. When Murray arrived in Guadalcanal, he was informed that his services would be made available to the Americans in whatever capacity they desired. A few days later, he was taken by American transport plane to Noumea on New Caledonia for conferences at Admiral Halsey's Headquarters. From Noumea, he was flown straight to Brisbane where he reported immediately to Commander McManus. He then returned to Guadalcanal where he joined the crew of a B-24 bomber on a daily routine search between Emirau Island and Truk in the Caroline Islands. For his next mission, Murray chose his own team from the members of the New Ireland party - Sergeant Bill Dolby, and four native scouts, Nein, Sarlie, Selas, and Keip Marlin. There are many stories about the exploits of Z Special Unit and the Coastwatchers in WW2, much of it is still secreted away in vaults somewhere. All of its missions were cloaked in ultimate secrecy and even though it's been over 60 years since the end of World War II very little is known of its 182 missions. 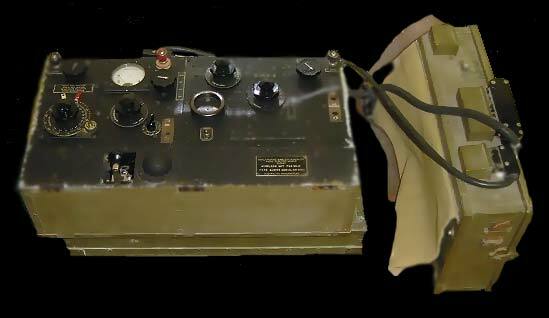 Coast watchers wireless radio, AWA Field Set 6 Mk II Type 245775, Serial No. 3064. With power supply pack, Type IH6439, Serial No. 2310. "THEY WATCHED, WARNED AND DIED, THAT WE MIGHT LIVE"
HUNTED, 'A Coastwatcher's Story', by Mary Murray, the wife of Harold Murray. Specialty Press Limited, Melbourne, 1967. Lord, Water, Lonely Vigil, Viking Press, New York, 1977 .The story of the Coastwatchers of the Solomons.